Come join us for some great whale watching without being in a crowd! Offered weekdays through March 31st. 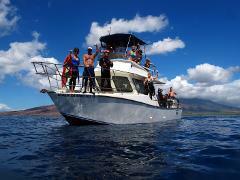 Our most popular trip, this 2-Tank dive charter usually visits Molokini Crater first and is followed by a dive along the shoreline where we are likely to see turtles! 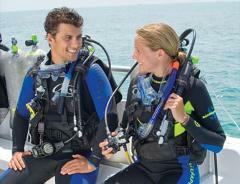 On M,W,F we also offer introductory dives! Scroll down for more info! Have you always wanted to try diving? This is a great way to experience snorkeling and diving all in one trip! 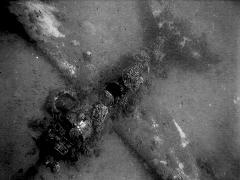 This is Captain's choice...conditions and coolness factors will determine where we go on these dives! Great adventures await you! Sometimes you just want to sleep in and then get your Scuba on in the afternoon, and we totally get that! Afternoon dive and snorkel trips meet check in at 1:00 and usually dive along the Pali. These two sites are great for history buffs and macro photographers! 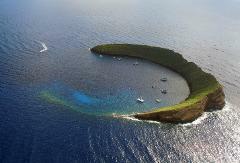 If you're looking for something a little different than a Molokini charter, this could be just the thing for you! 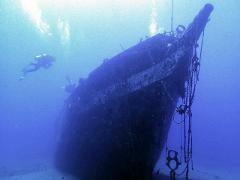 This is a wonderful wreck that sits in 96' depth and boasts a wide variety of wildlife. Our second dive will be along the beautiful West Maui coastline. Advanced enough for Molokini's Backwall but also wanting to see some Turtles while you are here? This charter has a bit of both! Looking for something a little out of the ordinary? This may be just the dive for you! Want the whole boat all to yourself for that special event or family gathering? This is the option for you! Night Dive - woo hoo! This is a 2 tank dive and will likely occur around the Pali from Maalaea Harbor. We will see invertebrates, fish, nudibranchs, and whatever reveals itself at night.